HAMCAMS are two cameras mounted on the roof of Lick Observatory. Images on Mt. Hamilton and the valley below. A new set of stills and a movie daily. For more information on the HAMCAMS see Gary’s post. Posted in Environment, Fun, Outdoors, Weather | Comments Off on Let it Snow! It was beautiful weather for students at San Jose State University today. The Cesar E. Chavez Monument, also known as The Arch of Dignity, Equality and Justice, was really beautiful today and I had to share it with those of you who don’t spend time on the SJSU campus. Enjoy the weather today, it will be back to the 60s the rest of the week (but still sunny!) and possibly rain on Monday. It’s going to be another hot one in San Jose! Keep an eye out on pets and the elderly. If you’re going to do any outdoor activities, be sure to stay hydrated and if doing lots of physical activity, keep those electrolytes in balance with a sports drink. 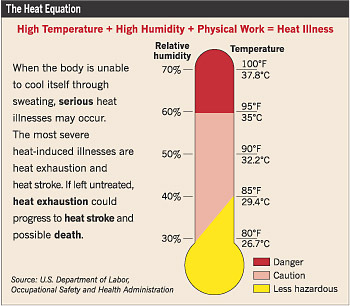 If ever, especially at 103 degrees F, you start feeling chills — that’s a really bad thing. It means you are dehydrated. Stop whatever you’re doing and evaluate whether you should continue. I’ve been there on long bike rides and it’s a bad place to be. Be sure to drink before you’re thirsty — if you’re thirsty, it’s too late. This is all, of course, an excuse to beat the heat. For those in the valley who do not have the luxury of air-conditioning, relief may be as simple as an afternoon at the movies or a mall. For others it may be more relaxing or practical to spend the day at a local community cooling center. Keeping cool is critical for the elderly, infants and young children. At risk are people who are physically or mentally ill; especially those with heart disease or high blood pressure. Note: A bag lunch or dinner from home may be required.